- Publisher Turner McNeally's daughter has gone off to college, and her horse is demonstrating signs of lonelinesss. Rebecca Wilkinson's son hasn't spoken a word since his father's death, and the family counselor suggests a pet. This Christmas, the chance to hear her son's voice again would be the best gift Rebecca could receive. 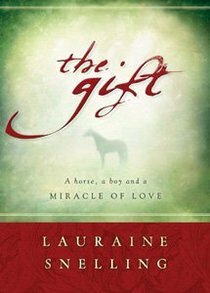 Beloved author Lauraine Snelling weaves a story of holiday romance in which a simple advertisement for a horse's companion creates a family bond and sparks unexpected love. - Publisher When Turner McNeally's daughter goes off to college, the girl's horse shows signs of loneliness. Rebecca Wilkinson's son hasn't spoken since his father's death, and the family counselor suggests a pet. Snelling weaves a story of holiday romance in which a simple advertisement creates a family bond and sparks unexpected love. Turner McNeally's daughter has gone off to college, and her horse is demonstrating signs of lonelinesss. Rebecca Wilkinson's son hasn't spoken a word since his father's death, and the family counselor suggests a pet. This Christmas, the chance to hear her son's voice again would be the best gift Rebecca could receive. Beloved author Lauraine Snelling weaves a story of holiday romance in which a simple advertisement for a horse's companion creates a family bond and sparks unexpected love. When Turner McNeally's daughter goes off to college, the girl's horse shows signs of loneliness. Rebecca Wilkinson's son hasn't spoken since his father's death, and the family counselor suggests a pet. Snelling weaves a story of holiday romance in which a simple advertisement creates a family bond and sparks unexpected love.